It’s a story we all know to some degree or other. The first two human beings God created, Adam and Eve (c. 6,000 years ago). Adam, created first, from the dust of the ground. Eve, formed out of one of Adam’s ribs. The blissful Garden of Eden. The two trees—taking of the wrong tree—the Fall. Expulsion from Eden. Cain, Abel and the subsequent repetitive course of human history and the human condition. Simple legend, so say most (even many Bible “believers”). Or is it? The amount of hard science behind it may come as a shock. In this article, we’ll look at how the extant evidence squares with the biblical account of the primeval couple. All human beings contain mitochondrial dna (mtdna). However, it is only passed on through the female egg. So while a son and daughter receive mitochondria from the mother, only the daughter will pass it on to her descendants. This provides a useful tool for geneticists to determine female lineage. Importantly, it has confirmed that all living females have descended, in direct lineage, from just one woman. This isn’t pseudo-science—this is an established, well-known, scientifically accepted conclusion. This woman is known as mitochondrial Eve. This field of genetic study developed in the 1970s. It was realized that matrilineal lineage could easily be traced back through history by analyzing and comparing the mtdna of different women. Mitochondrial dna changes rapidly and acts as a sort of molecular “clock.” Scientists use the differences—mutations—in a woman’s mtdna to calculate how long ago their most recent common ancestor must have lived. For a detailed explanation of how the process works, see here. The results of the mtdna study are fascinating. They prove that every human being has descended from one, sole female ancestor. All living can trace their lineage, in a direct line, to this female. So when did she live? This part is tricky. It’s based on mutations—how long it took for different females’ mtdna to mutate and diverge away from the original central mitochondrial Eve mtdna sequence. In attempting to calculate this, scientists generally place mitochondrial Eve as living about 200,000 years ago. Yet that date is highly speculative. It is based on a theoretical application of the molecular clock concept: Geneticists use this for both dating human and animal evolution, working from the assumption that the mutation of mtdna is constant (although, what is “constant” is speculative in and of itself). They can calibrate this with “known” dates for geological events, as well as with evolution’s sacred “fossil record.” Still, due to the vast number of unknowns and uncertainties, scientists slap onto the final number an extremely generous margin of error—for mitochondrial Eve, she’s placed anywhere between 50,000 and 500,000 years ago. So a median 200,000 years is the generally settled-upon date. 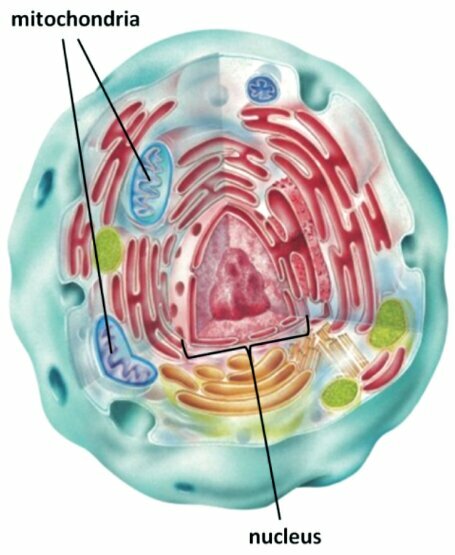 Cutaway of a human cell. The general answer is that some “catastrophe” caused the human population to “bottleneck” at the time of mitochondrial Eve—i.e., in the form of a volcanic eruption or a meteor striking the Earth. This left very few survivors on the planet. There were a small number of females—and in time, the female descendants of all but one woman died out, carrying all other unique mtdna to the grave. Thus, the mtdna of only one so-called “lucky mother” continued. Such an assessment is extraordinary. That after 2 million years-plus of human evolution—not including prior common ancestors—our human race would narrow down to just one single female’s lineage, somewhere in the realm of 200,000 years ago. That’s certainly quite a “bottleneck,” and the explanation beggars belief. Over deep time, any large population will accumulate enormous numbers of mutations, resulting in enormous amounts of genetic diversity. This is a serious problem for evolutionary theory because it is now clear that mankind is genetically very homogeneous—we have very limited genetic variation. [We] have been able to reconstruct and publish a very close approximation of Eve’s mitochondrial sequence. We found that the average human being is only about 22 mutations removed from the Eve sequence, although some individuals are as much as 100 mutations removed from Eve. … The most recent estimate of the mutation rate in human mitochondria is about 0.5 per generation. Thus, even for the most mutated sequences, it would only require 200 generations (less than 6,000 years) to accumulate 100 mutations. This calculation is based upon the most straightforward application of the molecular clock concept. If mutation rates were ever faster in the past, it would require even less time to accumulate 100 mutational differences. But the actual mean is just 22 differences—reducing the required time fourfold. So, according to Sanford and Carter, if we are to abide by a reasonable mutational clock, our mitochondrial Eve easily dates back within 6,000 years—the exact biblical time frame for mother Eve. That’s not to say, though, that mitochondrial Eve has to strictly be Eve herself: mtdna merely points to the most recent common female ancestor, and it could potentially have been one of Eve’s daughters or later female descendants. The main point is that this single common female ancestor fits squarely within the biblical time frame for Adam and Eve, thus remarkably corroborating the biblical account. The above-linked article by these authors is a great summary of the problems genetic research has been causing for the evolutionary theory—including the impossibility of a 70,000-to-200,000-year-ago population bottleneck. See their article for more detail, graphs and calculations. So what about patrilineal ancestry? Does mitochondrial Eve have her Adam? Yes—and no. Patrilineal ancestry can be traced with the Y chromosome, which of course is passed down from father to son. This one, though, appears to be a lot more difficult to trace genealogically, as opposed to mtdna. But, incredibly, geneticists concur that all humans alive came from just one paternal ancestor. The Y chromosomes of the world are remarkably similar, with only about one hundredth as much variation as on the other chromosomes. Mitochondria, in contrast, are quite variable. This lack of diversity among male lineages suggests that their common ancestor lived so recently that there has not been time for his descendants’ Y chromosomes to accumulate differences. One estimate is of only 27,000 years before the present. The last shared mitochondrial ancestor—Eve—may have lived tens of thousands of years before Adam, the last universal forefather. (Keep in mind, however, the above paragraphs of a mitochondrial Eve within the past 6,000 years.) Jones claims that Y-chromosome Adam “almost certainly never met Eve.” And, from a biblical perspective, Jones is absolutely right—because Y-chromosome Adam would have been, in fact, Noah! The Bible shows this clearly to have been the case. All humans descended from Adam and Eve. But only Noah, his wife, and his three sons and their wives survived the Great Flood (a “bottleneck” of sorts that, according to biblical chronology, happened around 4,500 years ago). It is from Noah’s family that all humanity derives. The closest common Y-chromosomal ancestor, then, would be Noah, who passed on his “Ys” to his three sons. But the mitochondrial Eve would have long predated this—the unique mitochondrial dna being carried on not from Noah’s wife, but from the sons’ wives, passed on to their future daughters. Jones’s simple principles of equating Y-chromosome Adam as being younger than mitochondrial Eve appear sound. However, his 1996 book is slightly “outdated” in the world of genetics. Genetic assessment of “Adam” has been a bit like flipping burgers. A 2013 study concluded that Y-chromosome Adam lived 340,000 years ago. Research in 2014 concluded that the 2013 study was basically junk science and moved Adam to 200,000 years ago. In short, over a brief period of time, Y-chromosome Adam has literally gone from being far younger than Eve to being far older than Eve to having lived roughly around the same time as Eve. Dates fluctuate between 50,000 to 600,000 years ago. There are just so many assumptions involved. 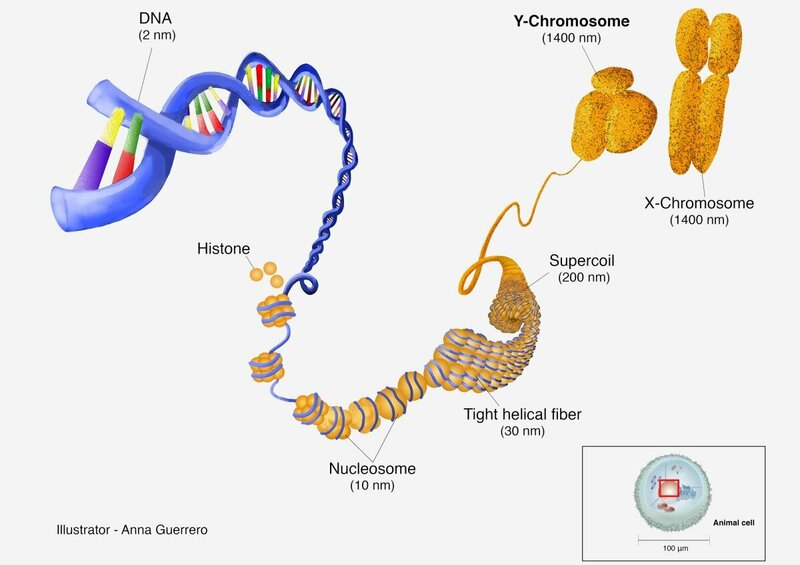 Today, the Y chromosomes of modern men are only about 300 mutations removed from Y-Chromosome Adam … if we assume a normal mutation rate for the Y chromosome (about 1 mutation per chromosome per generation), we would only need 300 generations (about 6,000 years) to get 300 mutations. This is the most straightforward application of the molecular clock concept. The numbers are in perfect agreement with the biblical perspective. However, in 100,000 years (the [young Adam] evolutionary perspective), we would expect about 100,000 mutational differences between modern men and Y-Chromosome Adam—about 333-fold more than is actually seen. The numbers speak for themselves. Modern males are approximately 300 mutations away from Y-chromosome “Adam”; perhaps one mutation, maybe more, per generation. Modern females are up to 200 mutations away from mitochondrial Eve; perhaps 0.5 mutations, maybe slightly more or less, per generation. What do we find? We have a “nearest common ancestor” time frame that remarkably fits into biblical chronology. An “Eve” and an “Adam,” so to speak (or, more properly, Noah). Besides all of that, to the Bible believer, it would only make sense for God to create Adam and Eve with a high amount of genetic diversity to begin with—that this couple would be overly heterozygous right from the start. Thus, further condensing the amount of time necessary for mutations to take place. So we have our earliest common ancestors, according to genetics. Segueing into a slightly different subject: Where did they come from—literally? The Bible says that the first man was formed “out of the dust of the ground.” What has science shown? And the Lord God caused a deep sleep to fall upon Adam, and he slept: and he took one of his ribs, and closed up the flesh instead thereof; And the rib, which the Lord God had taken from man, made he a woman, and brought her unto the man. And Adam said, This is now bone of my bones, and flesh of my flesh: she shall be called Woman, because she was taken out of Man. The first woman was made from the rib of the first man. To the unbeliever, this is preposterous. To the believer, God is capable of anything. What does science say about it? God operates on Adam’s rib. Etching by G.B. Leonetti/C. Cencioni/Nicola Pisano. The choice of a rib is interesting. For this article, we won’t get into the symbolism of the rib, being at the side of man, etc. But in terms of construction, science has discovered a trait unique to ribs: they actually regenerate. Scientists have discovered that if the perichondrium (the membrane covering the rib) is left in place, then the bone will actually regrow inside of it. Much of the knowledge on this subject has only emerged over the last few years. The rib is the only known bone to do this. Bone from the ribcage is used by doctors to reconstruct damaged bone tissue in other parts of the body. One could say that with the use of rib bone in reconstructive surgery, doctors are unwittingly replicating (in a minute way) Genesis 2—using a rib to “create” (or rather, “complete”) a human being! The Bible continually affirms the perfection of God’s creation. Did God thus intend for Adam to continue in life odd-ribbed? Perhaps. But perhaps He deliberately created and used the specific bone that would regenerate itself, thus leaving no imperfections behind. One more key point on the science behind the rib: Bone marrow is one of the key sources for stem cells. These are cells that can convert into all types of cells in the human body, thus enabling the creation of a complete human being, i.e. Eve. And the ribcage is a notably prolific producer of these cells. How could the ancients have known these features about the humble rib, thousands of years ago, when they were “making up” the story of Adam and Eve? Just a “lucky chance” that they picked the one regenerating bone, rich in stem cells? A remarkable archaeological account gives further link to this creation of Eve. The ancient Sumerians (an early culture that only ended around 4,000 years ago) believed in an original “garden of gods,” and that the land in it was watered from the ground (similar to Genesis 2:5-6). They wrote of an early being named Enki, who succumbed to an illness in many of his organs, including specifically his rib (curiously, this illness came from eating “forbidden flowers”). For each afflicted part of the body, a female being was born. In order to heal the rib, a female named Ninti was born. “Ninti” means Lady Rib. The parallels with Eve are clear—and ancient. The extant story featuring Ninti goes back around 3,800 years—and the original form may well date even earlier than that. What, then, caused the word for rib to become synonymous with the word for life? And how did it come to be used as the name for the “mother of all living”? Just purely coincidental linguistics? Or a deeper, foundational history? Stepping away from Sumerian tradition, we have an interesting Eve type among the Greek pantheon. To the Greeks, the goddess Gaia is considered the mother of all life. This name is believed to be a pre-Greek word of uncertain origin, meaning “Earth” or “life.” Gaia, of course, also comes across as an Eve type. Eve’s name in Hebrew is Chawah, also directly related to the Hebrew name Chaia, both words symbolizing “life.” In fact, the words Gaia and Chaia properly pronounced are very similar. 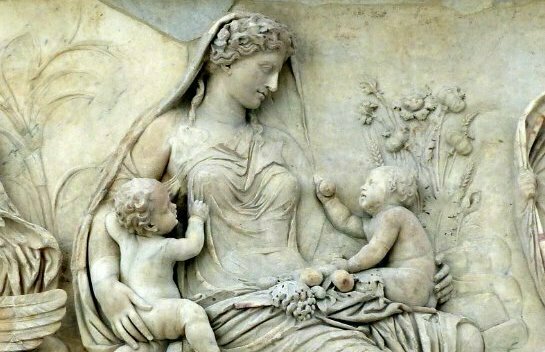 Her ensuing family closely resembles that in the Bible: Gaia’s child Cronus, whom she bore with the first “father” god Ouranus, was the patron of the harvest and is symbolized by the sickle and grain. Adam and Eve’s son Cain was likewise known as a “tiller of the ground”—a crop farmer (Genesis 4:2-3). Later descendants of Cronus/Cain include a family that parallels the one mentioned in Genesis 4. See our article here for more information (at subhead “Jubal—Early Music Pioneer”). We’ve looked at a couple of ancient “Eve” parallel accounts (there are many more). What about Adam? Surely the name of the earliest biblical human would be used in early secular history. The name Adam is attested to on the Assyrian King List. This list is known from tablets dating back to the 11th century b.c.e., but even these copies are known to have come from an earlier original source compiled c. 1800 b.c.e. Assyrian king list. 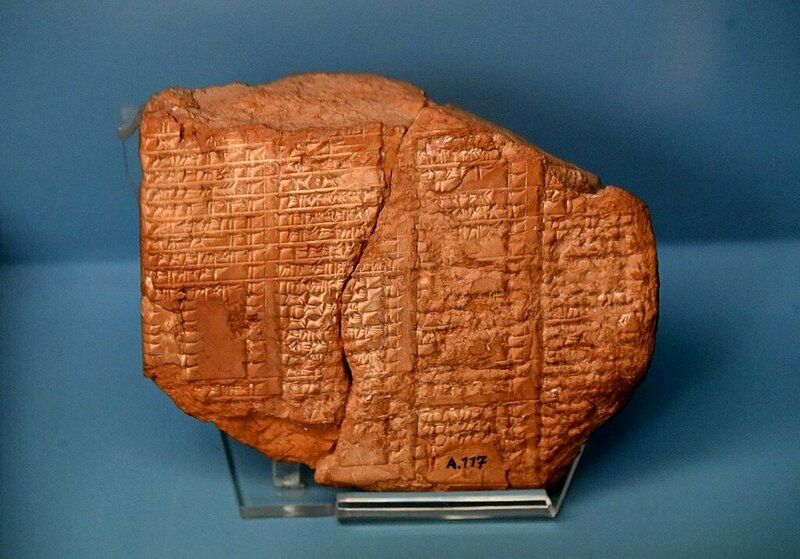 Terracotta tablet, from Assur, Northern Mesopotamia, Iraq. Neo-Assyrian Period, seventh century B.C.E. Ancient Orient Museum, Istanbul. The name is listed, in slightly different Assyrian form, as Adamu, second ruler of Assyria. While nothing is known of his reign, it is speculated that he ruled around 2400 b.c.e. Historian and Egyptologist David Rohl has put forward that this figure could even be the biblical Adam himself. This is because the name of the “first” king, Tudiya, is placed on the list directly before Adamu, i.e. “Tudiya Adamu.” If the word “Tudiya” is taken as a verb rather than a personal name, we have the phrase “Beloved of god, Adam.” Rohl believes that the two words describe one and the same individual. Evidence for this can be found on a later Babylonian copy of the king list—here, the two names appear to be joined together in heavily corrupted form: Tubtiyamutu. Whether or not Adamu is a reference to the Adam of the Bible, the Assyrian king list clearly shows the name to be one used very early on in human history. Atum, an ancient Egyptian god of creation; based on New Kingdom tomb paintings. Another “Adam” parallel can be found in Egypt, among its pantheon of gods. This specific god was worshiped very early on in Egypt’s history (c. 2500 b.c.e., if not earlier). According to the Heliopolis creation myth, he was known as the “first god and living being.” His name? Atum. (Note that linguistically, “t” and “d” sounds are known to be readily interchangeable, especially cross-culturally.) This “first being” Atum emerged from a chaotic state of darkness and a primordial watery abyss. This brings to mind biblical description of the world before the creation of man: “And the earth was without form, and void; and darkness was upon the face of the deep. And the Spirit of God moved upon the face of the waters” (Genesis 1:2). As opposed to God creating Adam, however, the Egyptians (in typical fashion) have Atum creating himself! The biblical Adam had a son named Seth. Interestingly, the Egyptian Atum’s great-grandson is also named Seth. While there are, of course, many differences with the Egyptian (and above, Assyrian) accounts, the elements that are similar are intriguing and impossible to ignore. Mere coincidence? Surely not. So where did they come from? A common historical memory of an actual event? Adam and Eve have been artistically portrayed perhaps more often than any other human beings—at least, any other couple—in history. Examples of this couple abound, going back some 2,000 years. But these depictions are incredibly young when compared with a possible contender for the earliest “portrait” (actually, it’s technically a landscape)—this one, a c. 4300-year-old artifact. It’s a greenstone seal, dating to around 2250 b.c.e. Since its discovery (at least, over the past 150 years), it has been related to the “fall of man” in the Garden of Eden—for good reason. The seal depicts a fruit tree, along with a female figure seated to the left of the tree and a male to the right. Both figures are reaching for a piece of fruit. A snake is angled toward the woman, its head close to hers. The imagery so closely parallels the story in Genesis 3—the serpent tempting the woman, and both the woman and the man taking of the fruit of the tree. This scene has been reproduced in various forms throughout history. Of course, in “modern” artwork, Adam and Eve are depicted “in the raw.” The early eastern Mesopotamians, however, seem to have been a bit more “prudish” in terms of clothing (see our article here on the outfits of the ancients). 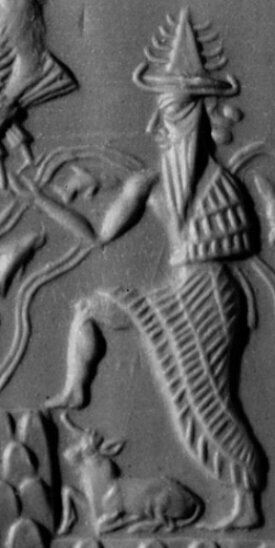 This may explain the clothing of the figures on this seal. Further, it seems some ritualistic embellishment was added—the male figure given horns as a deified individual. We know well that in these early sculptures none of these figures were chance devices, but all represented events or supposed events, and figures in their legends; thus it is evident that a form of the story of the fall, similar to that of Genesis, was known in early times in Babylonia. Could this early depiction—so “close” to the biblical time frame of Adam and Eve—have been a memory of a real, “recent” event? Was it just lucky chance that the ancient biblical writers described, quite clearly and specifically, snakes as starting out with legs, before being condemned, “broken,” to just slither along the ground? How were they to know? Were they part-time embryologists, able to examine early bone development? Paleontologists, discovering the fossilized remains (of which we have only one known, good preserved example of a four-legged serpent specimen)? Osteologists, examining existing minuscule “vestigial” appendages left in certain species? Or instead, could it be that they were made aware of some original, source event that actually happened—something that also resulted in the snake being (arguably) the oldest and most universal mythological symbol—often associated with evil and death? The idea that Adam and Eve were just a legendary story, conjured up by a late biblical forger, is categorically false. The evidence speaks for itself. Science confirms that all living humans have one single, recent female and male ancestor. Archaeology has given a glimpse of the antiquity of the story, at least as far back as 4,300 years ago. Parallel stories from cultures worlds apart preserve similar accounts of the primeval couple. Simple human biology accounts for the materials that Adam was made from. It even provides good reason for Eve being created out of a rib. Given all of this, what are the chances that this story is just a petty fairytale? The earliest large cache of discovered Scripture (the Dead Sea Scrolls) dates back c. 2,200 years. Further slivers of Scripture date back 2,700 years. According to biblical chronology, Moses wrote the Torah 3,400 years ago. Parallel accounts of man’s genesis date c. 4,000 years ago, sourced from material even earlier. Given such an early nature of their writings, how were the ancients to know that man’s genetics go back to a recent mitochondrial Eve and Y-chromosome Adam, fitting within the age range? How were they to know that man’s elemental composition actually matches that of the soil that he is said to have come from? And how would they know to choose the rib for Eve, the one bone only recently discovered to regrow, and rich in stem cells, the building blocks of life? And why is the four-millennia-plus Sumerian word for rib equated to the word for life? Just lucky chance? There’s a lot more science behind the earliest chapters of Genesis. We’ve essentially left untouched the numerous ancient parallel accounts of wider creation that provide incredible links to the biblical account. You can read a sampling of them in our article “The Genesis Account of Creation: Just a Bible Story?” Also check out the other articles in this series, looking at parallel ancient accounts found all around the world of a great Flood and tower of Babel–confusion of languages. As we so often say, a common tradition points back to a common origin event. Again, I recommend Sanford and Carter’s article (quoted above), “In Light of Genetics … Adam, Eve, and the Creation/Fall.” Drawing on their professional experience, they provide hard science that thoroughly condemns the evolutionary theory, particularly from the genetic standpoint. Of course, you won’t find this material readily admitted by evolutionary-minded genetic scientists, because to them, no matter the evidence, God cannot, by any means, exist. Click here to read or request your free copy of Does God Exist? So did Adam and Eve exist? In the end, that’s asking the wrong question. More appropriately, does God exist? 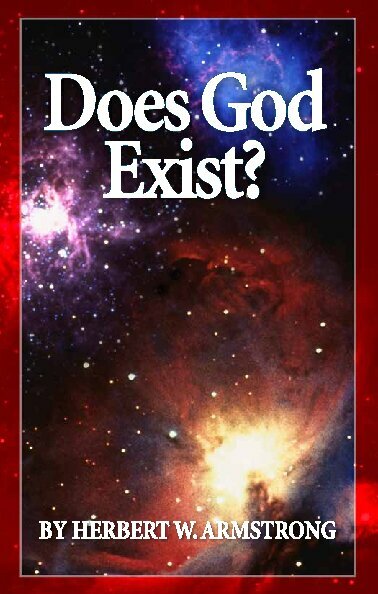 Take a look at our free 13-page booklet Does God Exist? to find out for yourself. The science behind it is one matter. To believe it is another. The Genesis Account of Creation: Just a Bible Story?